It’s nice to have a “go to” pasta salad that can be ready when you need one. 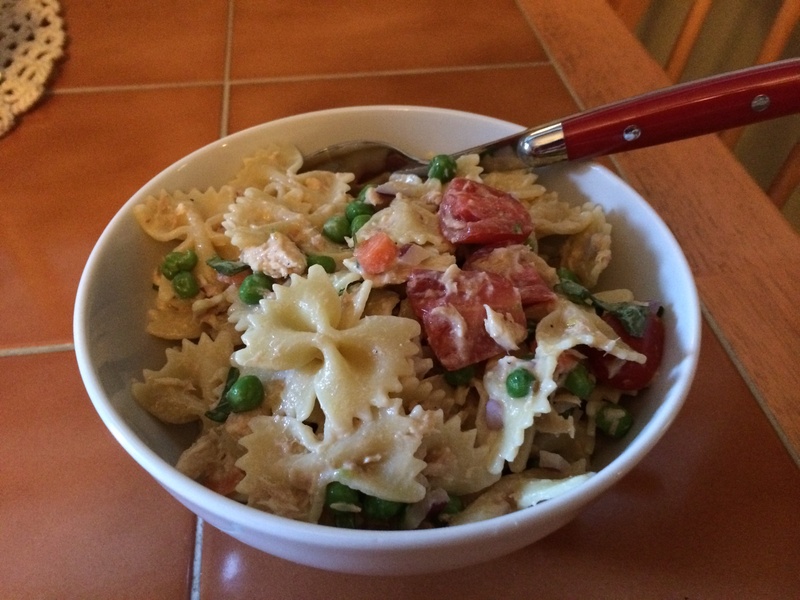 My pasta salad is loaded with veggies, bow tie pasta. ribbons of basil, and a Caesar dressing. I chose the Caesar dressing because of the flavor. I love a Caesar salad so I thought why not. Now I have made a homemade Caesar dressing before, but I have to say there are some really good ones on the market that can save you some time and energy. Start by salting your pasta water when it comes to a boil. Then follow the instructions on the pasta box. In the mean time cut your onion up in a small dice, then the carrot. Slice the grape tomatoes length wise. Take the thawed frozen peas and mix them together with the red onion, carrot and tomatoes. Roll up your basil leaves like a cigar then finely slice them from one end to the other this is called Chiffonade. Add your basil last thing after everything is mixed together. The basil will look like ribbons. Add salt and pepper (remember Caesar dressing has salt already so add a little then taste). Pour in your dressing about half the bottle at first, you can always add more. Then toss in the pasta while it’s still warm and mix gently. Finally finishing off with adding the basil ribbons. The pasta will absorb the dressing because it’s warm, so then you will know if you need a little more. You don’t want to add too much or it will be soupy, you want to dress it just like you would a salad.